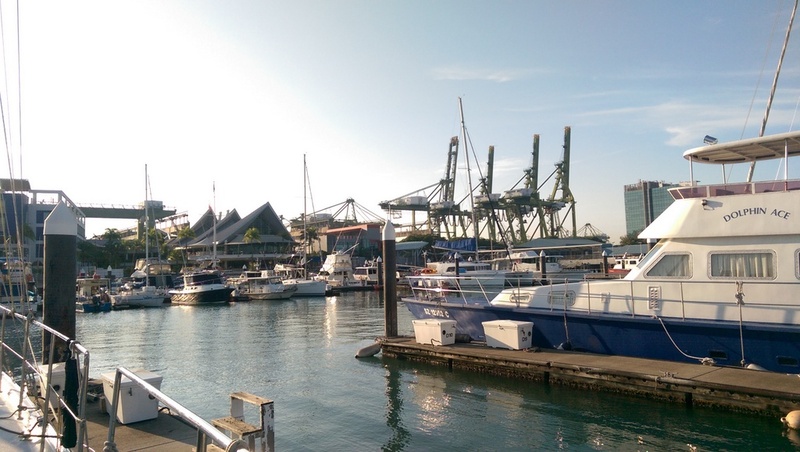 We arrived in Singapore yesterday and berthed in the Republic of Singapore Yacht Club (RSYC) located on the southwest coast of Singapore close to the National University of Singapore. 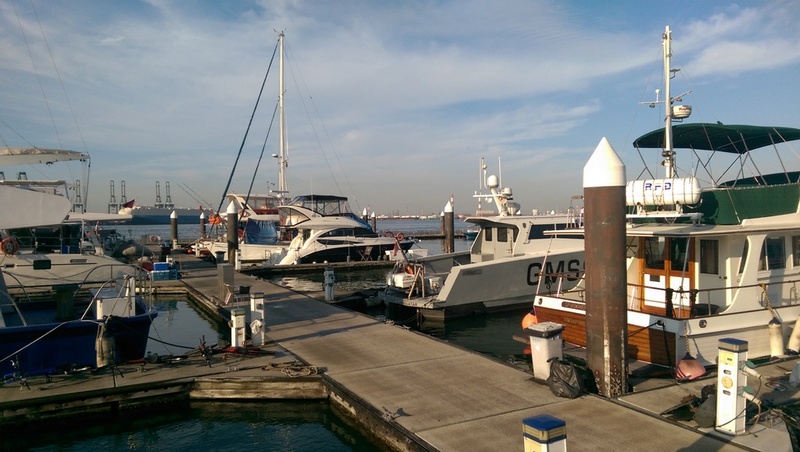 The marina has no seawall and is adjacent to a very busy dock that is used by the boats transporting staff and goods out to the many ships at anchor. Thus, as one might expect, there is a lot of swell working its way in and all boats here are rocking and rolling. Fortunately we were able to get a "single" berth which means that we are able to tie dock lines on all sides and not be held onto a pontoon. We are berthed at D11. 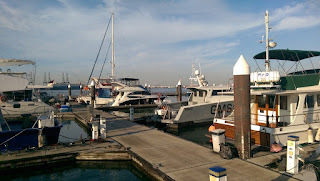 The staff is helpful and Zaina who manages the marine is very capable and was most responsive when I call for a berth. We got our official "clearance" from Immigration by anchoring off of Sisters Island and waiting 15 minutes for their launch to come by. No tying together, no boarding. They have a net on a stick such as one uses to bring in fish into which one puts the paperwork and passports. After reviewing the papers, stamping things, they are returned the same way. 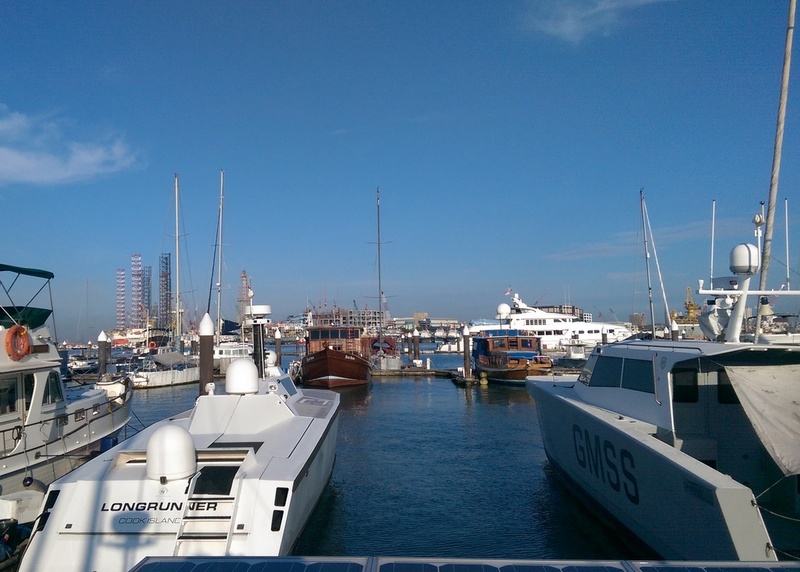 The marina is about 45 minutes from the clearance anchorage. The bars, restaurants, pool, showers and gym here are first rate. The pontoons in the marina have seen better days. Mostly motor vessels here and a few catamarans that do charter. Note the blue skies in the photos. The 3 months of smoky haze has finally been blown away. What a relief! There are also 3 very special boats berthed across from us. These are from a Singapore company called Zycraft. See zycraft.com Their boats are manufactured from carbon fiber and carbon nanotubes and used for very specialized work. One is even an unmanned vessel that can patrol at sea for up to 30 days at a time.